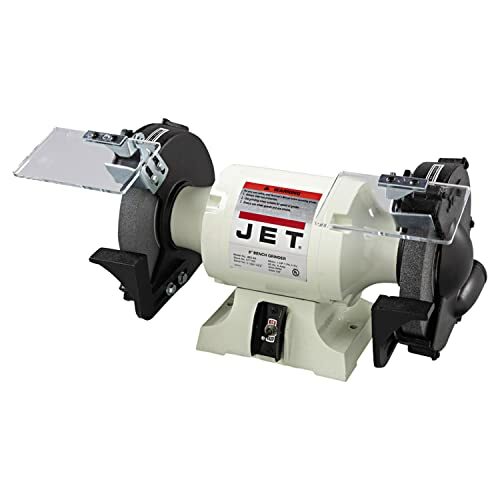 When it's time to shop for the best bench grinder for your workshop you will want to look for one that provides all the different grinding operations that you're likely to need. These will include rust removal, deburring, sharpening tools, the ability to clean objects, and shaping parts. Here we will take a look at 4 precision grinders and help you understand which one is the best for your workshop. ​What Are Some Of The Benefits Of Owning A Bench Grinder For Your Workshop? At first thought, a bench grinder might be considered a very simple tool that is less important than others found in the workshop. But by keeping tools clean and sharp it can improve the efficiency of the work that's being done and it can reduce injuries. This makes choosing the right bench grinder for your workshop of great importance. The bench grinders that are needed for an average workshop are not very expensive and they are not very big so they don't take up a lot of room. The only thing that you'll need to do to secure the grinder is to mount it on a workbench. A quality grinder is easily able to repair punches and drivers, it can help smooth out welded joints, restore drill bits, knives, and scissors. For the majority of workshops that are at home, it will not be necessary to get a super high-powered commercial grade grinder. A grinder with a quarter or a half horsepower motor is more than adequate for most users. The wheels should be half an inch to an inch wide and five or six inches in diameter. For home use, there are larger grinders that are available and these are usually more powerful. The wheels are as much as eight inches or more in diameter and they will rotate up to 3600 revolutions per minute. This type of bench grinder will have 2 grinding wheels with each one on opposite sides of the motor. These wheels will have a guard that leaves about 90 degrees of the wheel exposed to access it for grinding purposes. This tool is used when there is a need for shaping certain types of materials as well as smoothing services and preparing them for things like being painted. It is used to help sharpen other tools that are made for cutting. They are capable of helping to modify parts that need to be resized and even restore rusted parts. The main part of the tool is its grinding wheel and there are different types of wheels that are used for the different jobs. There's a wheel that's made of grit that is used for buffing and wire brushes are used for removing paint and other tasks. It can be used to shape, grind, and cut metal or used to help make edges sharper and to smooth out metal. If you have a set of lawn mower blades that need to be sharpened this is the tool that can do it. 1. Do a complete safety check before turning on the grinder. Best Practices include checking the grinder to make sure it is firmly secured to the workbench. You will need to check the tool rest which is where the metal item you're working on will sit, and make sure that it is also secure. Make sure that there is no debris or objects that are around the grinder and there needs to be enough room to move the metal piece you're working on back and forth. When you're working on metal with the grinder it can sometimes get too hot. To cool the metal down you will need to place a container of water near the grinder. Simply place the metal in the water anytime it gets too hot. 2. ​Safety wear should always be worn when using a bench grinder. Make sure you have a set of safety glasses as well as some steel toed boots. It's also recommended that you use ear plugs or muffs and a face mask that helps protect you from dust that flies in the air while grinding. 3. ​When turning on the bench grinder stand to the side and allow the grinder to run until it's at maximum speed. You are now ready to begin using the grinder. ​When you begin working a piece of metal with the grinder you should place it on the tool rest and begin to push slowly until it touches the edge. The metal shouldn't touch anything but the grinder. You shouldn't allow it to touch the sides of the machine. ​Anytime that the metal becomes too hot then you should place it into the water that you prepared before you began. You will want to make sure not to put your face in a position where the steam can come back on your face as it could burn you. As the metal is hot you also need to handle it correctly so that you don't burn your hand. ​If you want to grind a piece of metal off of the object you simply move it back and forth across the grinder until it's been removed. If you hold something on the grinder in one place without moving it for too long it will cause it to heat up quickly. If this happens it can sometimes damage the peace. ​When you're trying to shape a piece of metal you use a similar action as when grinding it. You use a back-and-forth motion across the wheel. Anytime you see the metal turning orange it has become hot and you should pull away from the grinder. Once you get the metal in the right shape then you'll need to dip it into the water and allow it to cool. ​When sharpening a blade you will need to hold it securely using both of your hands. You'll push the blade at an angle to the grinder and you'll use an up and down motion so that the grinder is able to sharpen the edge. By moving the blade back and forth you keep it from becoming too hot and it also will prevent the grinder from cutting it and damaging the blade. 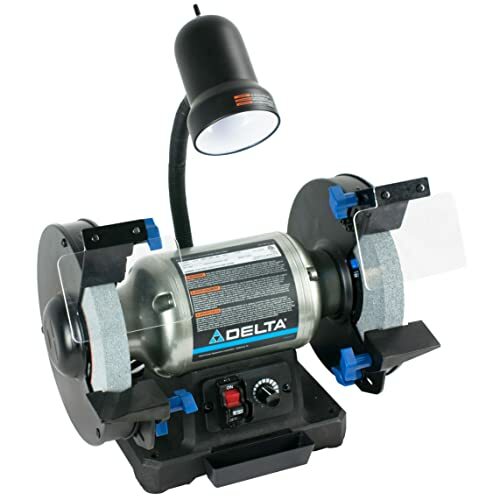 This is a convenient bench grinder for buffing, sharpening, and grinding as well as polishing. Its speed range is up to 3400 RPMs and has a variable speed dial. This model uses both 60 and 36 grit wheels for grinding and sharpening. The drill bit rest is milled into the Grinder which helps ensure you get the right angle on the tip. The instructions are very clear and concise and there were lots of great illustrations. It comes with a five-year warranty which is twice as long as many others come with. The slower speeds help do high precision types of work. For those who like American-made Brands this particular one is made in China. While the instructions and diagrams are very good, the assembly is a bit complicated. This model comes with an overload protection which helps extend the life of the motor. The product is very durable and it includes a three quarter horsepower motor and capable of industrial grinding. The 3600 RPM Motor is perfect for removing material from metal objects. The tool rest is precision machined which helps the user to position to work more accurately. The amount of power in this unit is substantial. Overall it's an industrial-strength grinder. This unit is much quieter than other models and the RPMs are faster. This model has a better than average life span and solid performance. This grinder vibrates a bit more than it should. Because of the amount of vibration, it is possible the plastic shield could break over time. This unit is powered by an electric cord, it's made in China and it comes with a one-year warranty. This model has a top speed of 3450 RPM and with a 2.1 amp motor. It has built-in work lights that work over each wheel. It has a tool rest that is adjustable to help for more accurate grinding. Its rubber footing allows for increased stability. This grinder is very quiet and almost silent. It's powerful enough to tackle most any job. It is very steady and stable and the rubber feet helps it to grip so that it doesn't move. For those that want a very safe grinder, this is a good choice. This machine does tend to get a bit bogged down when doing heavy-duty jobs. When doing heavier-duty work the machine seems to overheat. This grinder weighs 58 lbs and is powered by an electric cord and is 1 horsepower. It is considered heavy duty but does not come with a manufacturer's warranty. 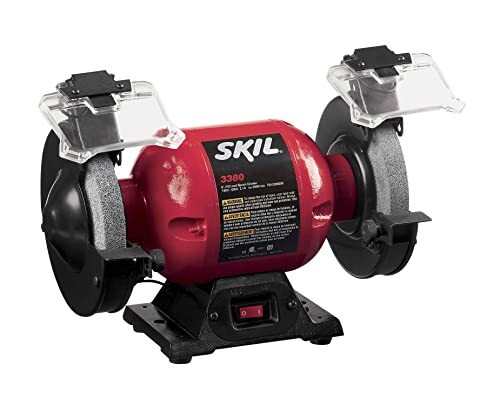 This is an 8-inch bench grinder that is powerful and made for industrial use. It has dust vents and cast iron wheel guards along with quick adjusting spark guards. This can be a good choice for a small shop as it has good power and little vibration. The cast iron stand makes it very stable when using. Comes with two separate small books of instruction that are highly informative. The motor takes a little bit more time than others to get running full speed. The tool rest and guards are not as well built as some other models. This machine weighs 21 lbs and is powered by an electric cord. It's extremely quiet and comes with a one-year warranty as well as a 30-day money-back guarantee. For the average user who wants to use a bench grinder in their workshop at home, any of the above choices would be fine. 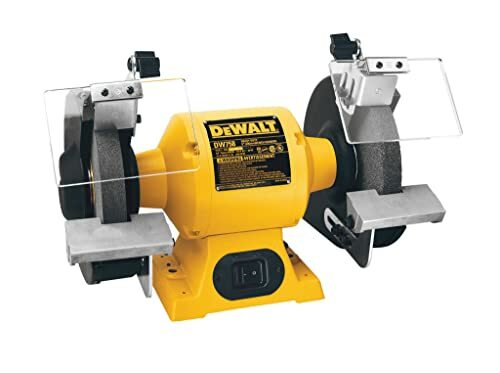 However, the DEWALT DW758 8-Inch Bench Grinder is the one that I recommend overall for the average user. When you compare the price and the quality it simply adds up to a highly versatile grinder that will give the best overall performance. It offers enough power and stability to work well and to last a long time. For home use, it is important that a unit like this be safe for average users. This model proves to be safe and stable without taking special care to be safe. Its features are solid and out of the box, it is easily assembled and ready to be used.